The concept of these cakes popped up inside my brain one night whilst I was trying, unsuccessfully, to get to sleep. My best ideas often appear that way. I wanted to use the new season British Timperley Rhubarb that had just appeared in the shops (as suggested by Claire) and it made sense to add a little nostalgia by teaming it with custard. I was also inspired by the myriad of uses that Vanessa found for rhubarb in Prepped. There is a spoonful of custard powder added to the basic cake batter, this makes them vanilla rich and golden. Then there is a liberal sprinkling of freshly roasted vanilla scented rhubarb on the top. To double up the flavour sensation I made two drizzle icings, one with syrup from the rhubarb and the other with more custard. Note 1: You will only need about 1/4 of the rhubarb you cook here, but you can turn the rest into a crumble, pie or fool. Note 2: You won’t need the full amount of icing that I made either, I got carried away. Make half this amount or feel free to drizzle it on other things you find around the house. Note 3: The rhubarb will yield a good 350mls of glorious pink syrup. This is a true food of the gods and should be poured onto anything and everything. Tonight I shall be making some of the syrup into a Rhubarb-tini, (just you try and stop me) George just had some mixed with soda as a refreshing drink, and I may even pour some over clotted cream ice cream for tonight’s dessert. 750g Fresh Chopped Timperley Rhubarb. Skinny is good. Put the chopped rhubarb in a shallow oven proof dish, sprinkle on the sugar and add the split vanilla pod. Cover with foil and bake at 180 degrees c for 30-40 minutes. Cooking it this way keeps the pieces whole and stops it being stringy. When it has cooled drain the juice into a jug and use the pieces of soft fruit for the cakes. Cream the butter, then add the sugar and beat until light in colour. Mix the custard powder with the flour and add this to the butter and sugar, add the eggs and beat well. Place a piece of baking parchment in the base of 6-8 small buttered tins. Sprinkle some of the baked rhubarb on each cake, or stir it in to the mix if you prefer. I will add some more to the mix next time to give the cakes extra tang. Bake for around 15 minutes at 175 degrees until they are golden brown. They should tip out of the tins easily after they have cooled for 5 minutes. NB: These would work just as well as cup cakes. Mix the icings until smooth and drizzle over the cakes with a spoon. It is beautiful stuff at the moment, but not cheap. Thanks for suggesting it as an ingredient as the colour really makes a post at this time of year. the look absolutely amazing! Great photography!! Thank you! Let me know if you make them. We had one each for dessert…slightly warm with a drizzle of rhubarb syrup and ice cream. Yes – I saw that batter cake and it looked great. I will try it one day for Sunday lunch dessert. It’s on my list again too! These look lovely! Love the custard icing idea! It’s a simple thing to do but it makes a great colour. The rhubarb syrup icing tastes even better. I just love these tiny cakes! Can’t wait for rhubarb to arrive in markets here. Great photos too! Your photos are gorgeous! I feel as if I could just lick the screen! 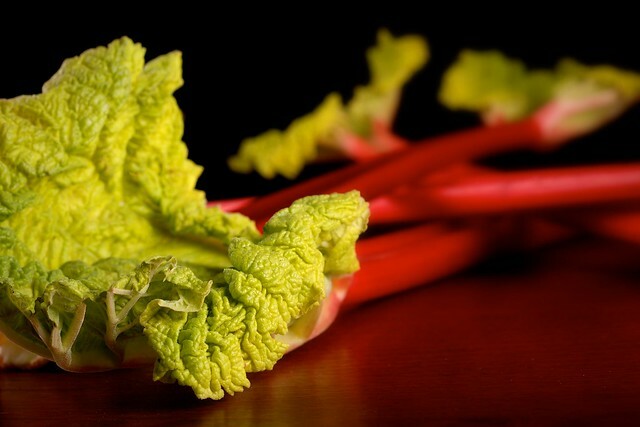 Mmmm rhubarb is one of my favourite ingredients! I agree you can pour it on anything. last summer i made a super yummy jam with rhubarb and fresh ginger. Here in Canada people seem to not pick them in their gardens though, so as soon as they pop up I’m going foraging. Ooh yes, with ginger is lovely, I love Rhubarb and ginger jam. Hi Sharon, if your rhubarb is not the ultra pink forced stuff you can swirl in a drop of red food colouring when it comes out of the oven to give the pink a boost! I am daft – I thought your comment was on my rhubarb cocktail post, which is the one that I meant sometimes needs a bit of pinking up! I love these and have been back on this page numerous times since I first saw them. I was wondering if you could provide any details on the tin type? I am trying to find similar – unsuccessfully – so any hint on where I could purchase them, or size, would be helpful. Thanks! Hi there Willow. They are loose bottomed non-stick mini cake tins. They were a gift from someone (someone who knows that a baker loves to get baking kit for Christmas!) I think they were possibly from TKMax. I have made them since in mini loaf tins and they worked well too, and a few as cupcakes were cute aswell. Anything will work well I’m sure. Happy baking, let me know how it goes. I love these, but then I LOVE anything rhubarb! 🙂 I have some frozen rhubarb in the freezer. I’ll have to give these a try! Thanks for sharing!